Dayna left yesterday afternoon, WAAAAAH. 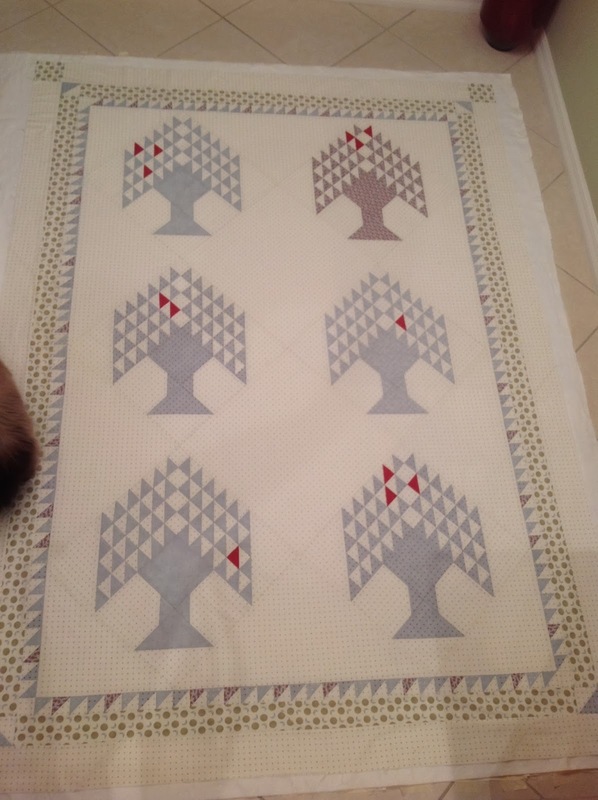 I did get a little sewing done while she was here for 5 days. 2. 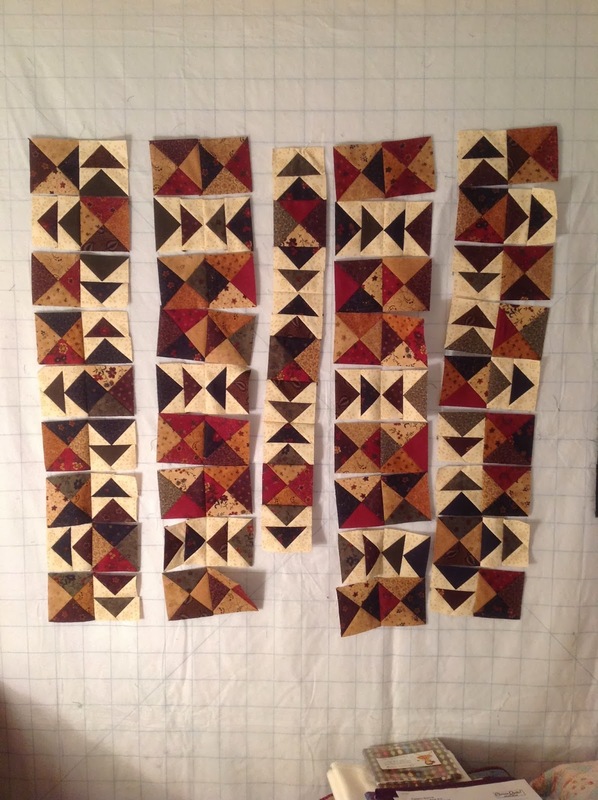 I did get another one of the 26 projects completely cut out and ready to sew. 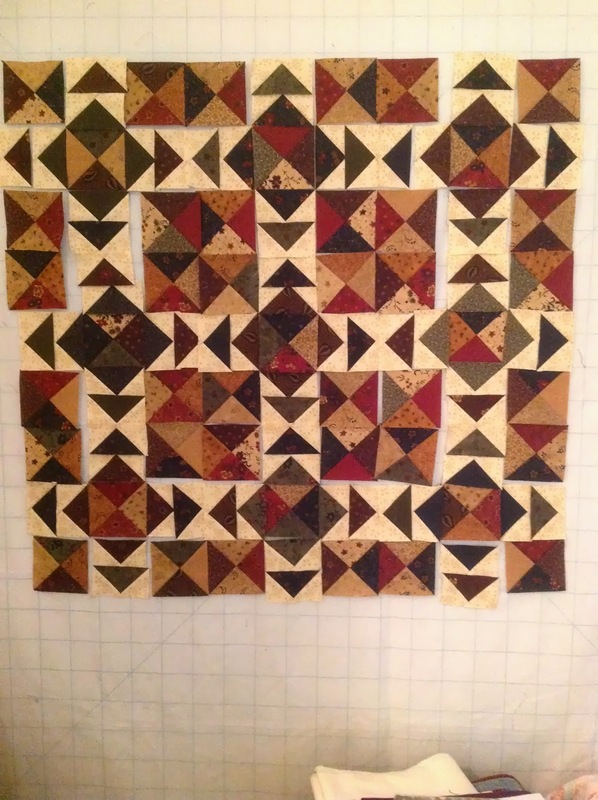 Well, not completely cut out; I still have the background fabric to cut out and once they send me the red fabric I was missing in my kit, I'll be able to finish cutting the block strips. 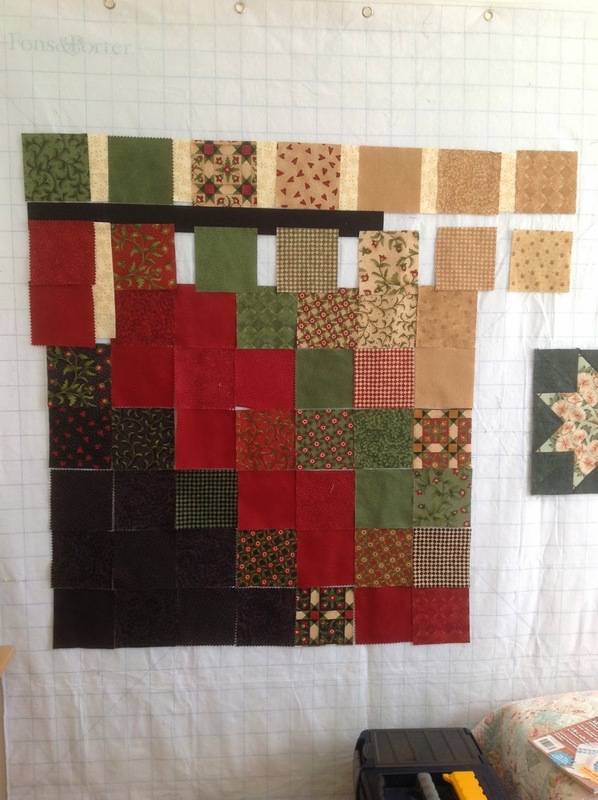 Yes, the first and only time I take the plunge and order a kit to make one of the quilts featured in American Patchwork & Quilting's Quilt Sampler, and 2 years after ordering it, as I'm cutting, I realize, something isn't right! 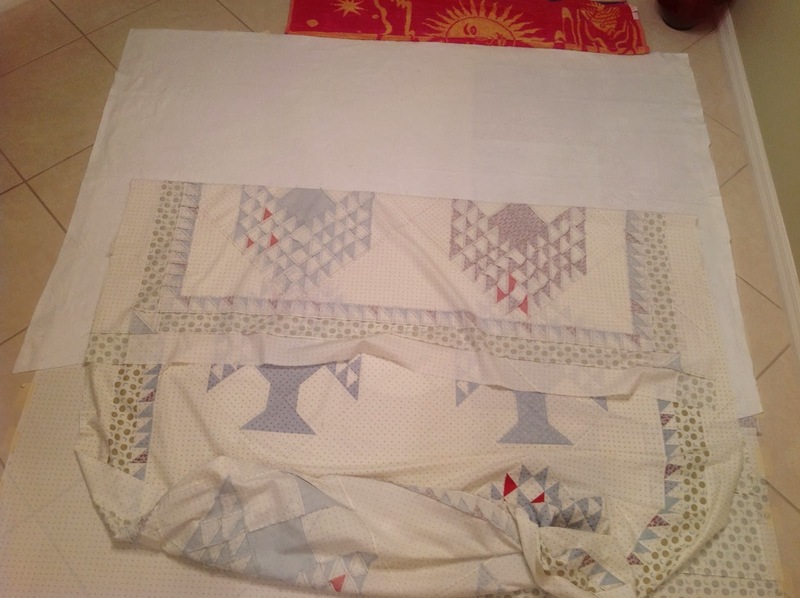 So I called the shop and they were mortified, but they have managed to find me 3 fat quarters of the red fabric (I was supposed to have 2/3 yard) which they've put in the mail. 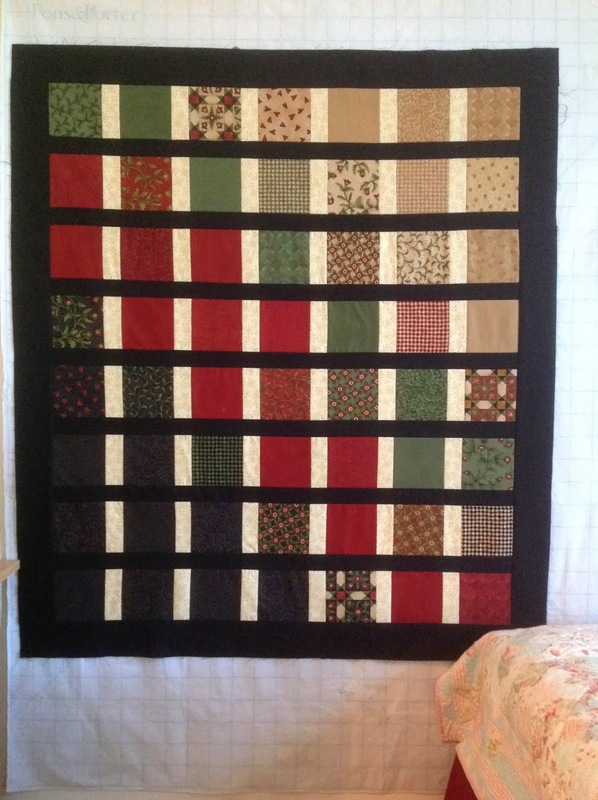 I might get it today...it's coming from Country Fabrics and Quilting in Brainerd, Minnesota. I must say I was happy with the way in which they handled this. However, I'm not so happy that the fabric in the kit is not exactly as shown in the magazine. 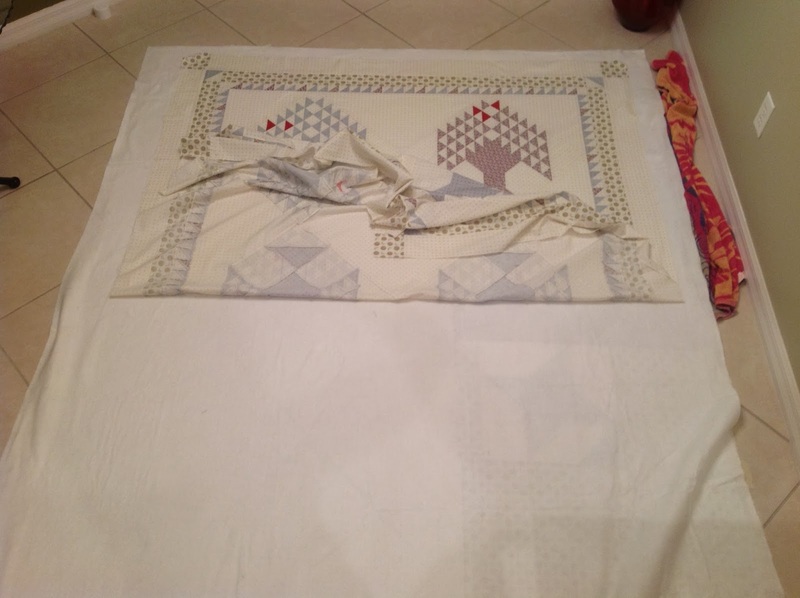 The tone-on-tone polka-dot background has been replaced with a solid, and the binding fabric has been switched to a different one that is within the quilt in the magazine, but not in the yardage I received. 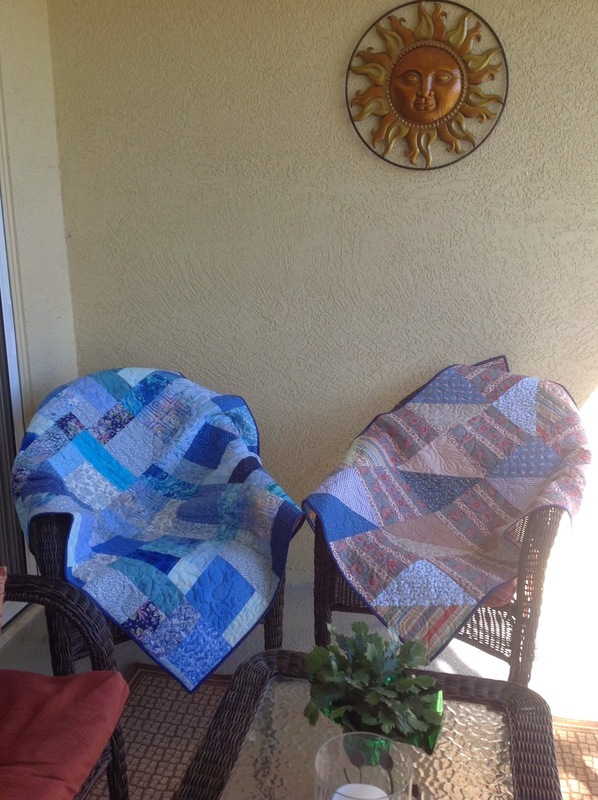 I have two entirely different fabrics that will be in my quilt that are not in the one in the magazine. 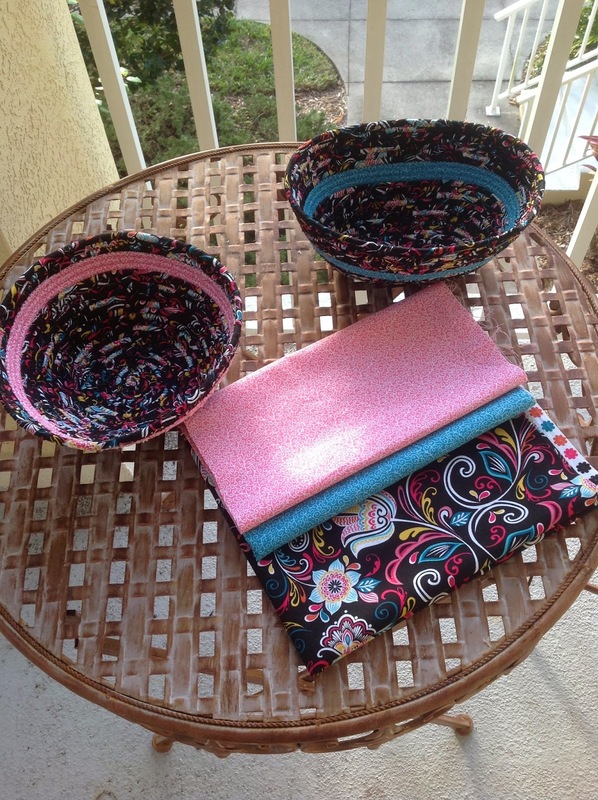 I think they should have said, "To order a kit of similar fabrics, yada, yada". So I will mention this when I call them to let them know the red has arrived. The magazine came out in September, and I ordered the kit in December, so perhaps they'd had more people order than they'd planned on, and couldn't get all the fabric back in? In any case, an accompanying note with my kit would have been in order. 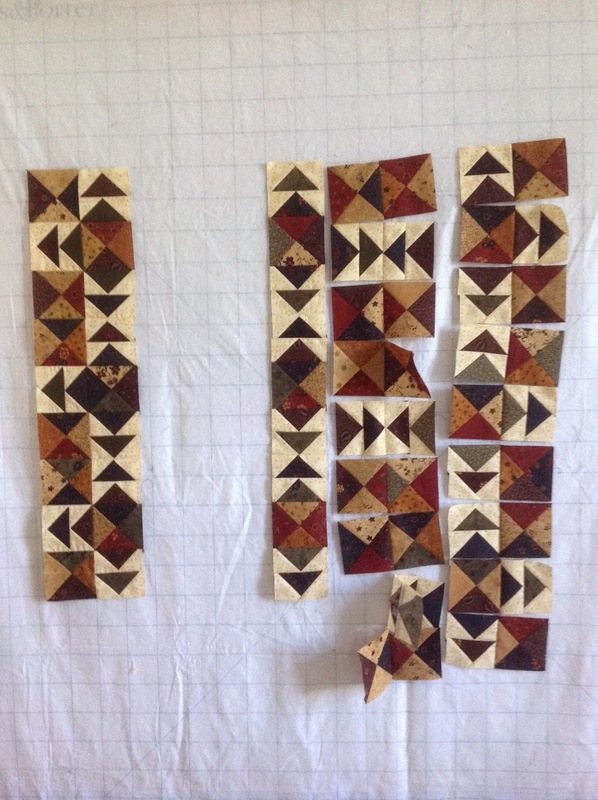 Here is a picture of eight blocks stitched up so far last night and today. This is not the final arrangement though. Out of my comfort zone for colours again, but I'm loving it! 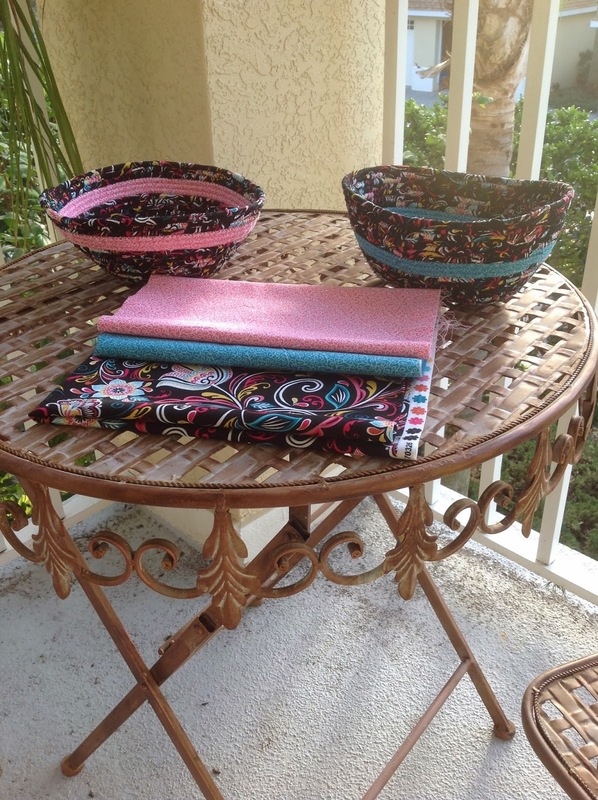 If you know fabric, you'll see that the majority of these are Tula Pink's Parisville line! So ironic because just lately, within the past 6 months, I've heard of her, and found out a little bit about her, and fallen in love with (and bought some of) her fabric line, Acacia! I opened this kit up properly, smoothed out the fabrics, and lo and behold, here is another line of hers. 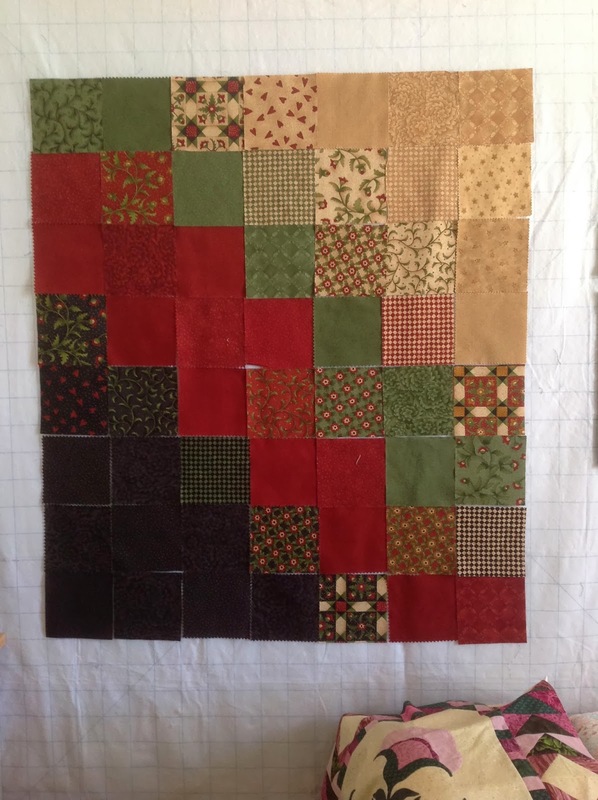 And, this is definitely leaning towards being a modern quilt, and within the past 6 months these quilts have been finding their way into my life, especially this red and aqua colour combination. AND, Parisville? With my lifelong love of all things French, as well as being a French teacher? Too funny. 3. I also sewed the four triangles onto my Self Round Robin, so it's now on point, waiting for appliqué. 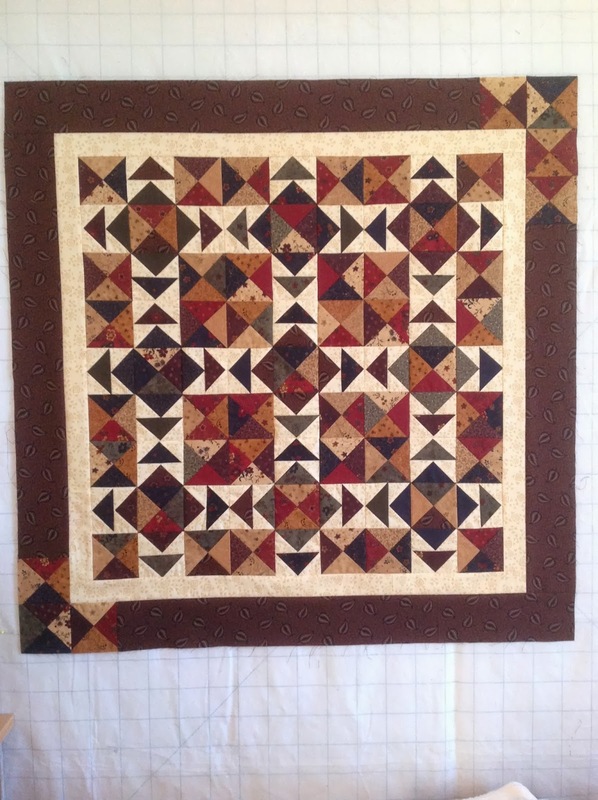 I THINK I have decided what I am going to appliqué on it! 4. 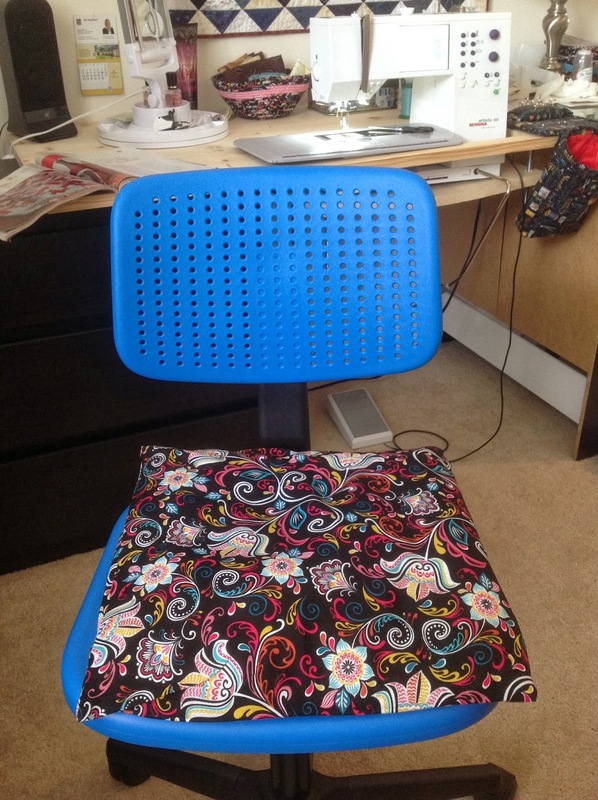 I covered an old flattened cushion that I have on my sewing chair. This needed to be done since last year. 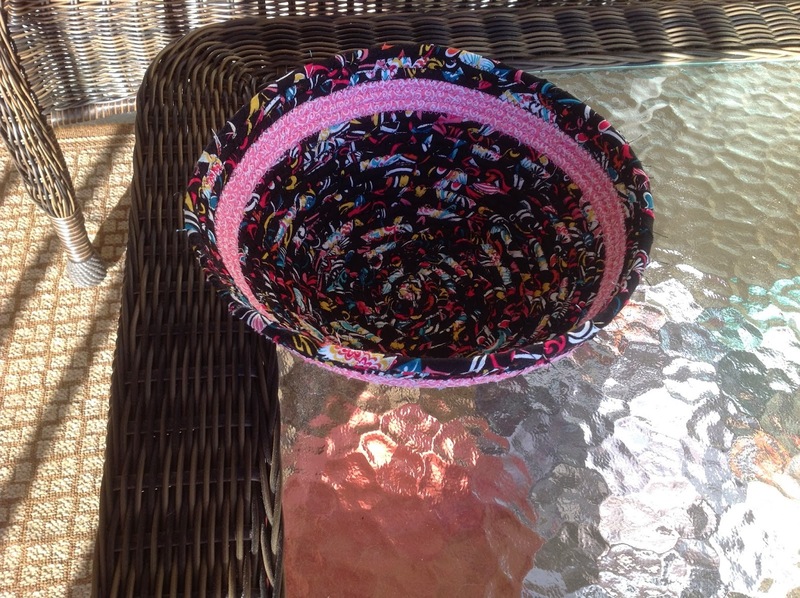 Can you tell that it's the leftover fabric from my clothesline fabric baskets?! There's one of them in the background. I love this cushion! So bright and cheery and it matches my blue IKEA chair just splendidly. 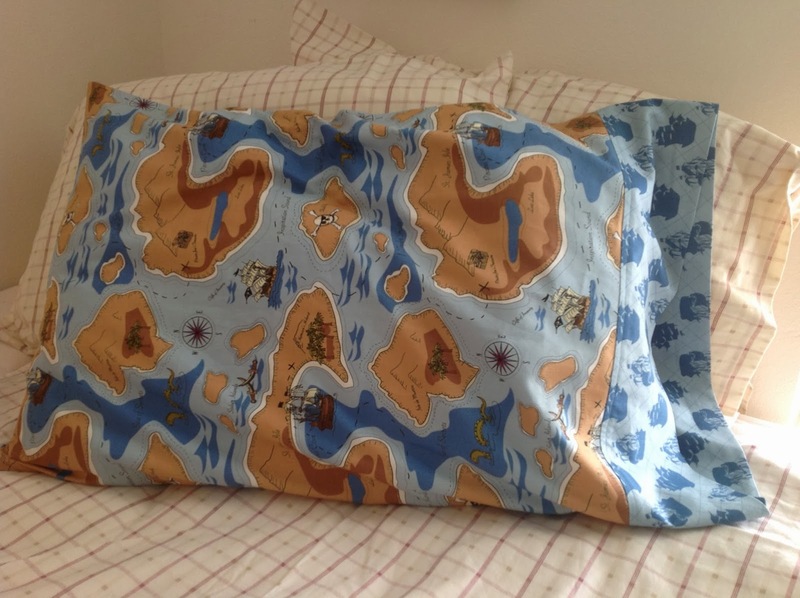 This morning I made a pillowcase for my grandson with pirate fabric I'd ordered for this express purpose from Hawthorne Threads. He loved the Tall Ships Festival in Essex County last year so much, and got right into all things pirate, so I know he will love this. 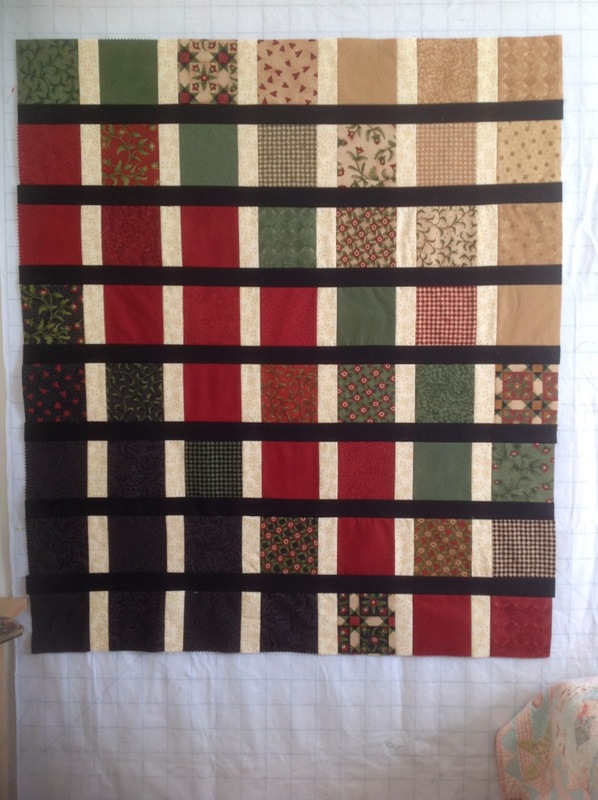 It's the Roll It Up pattern from All People Quilt.com. 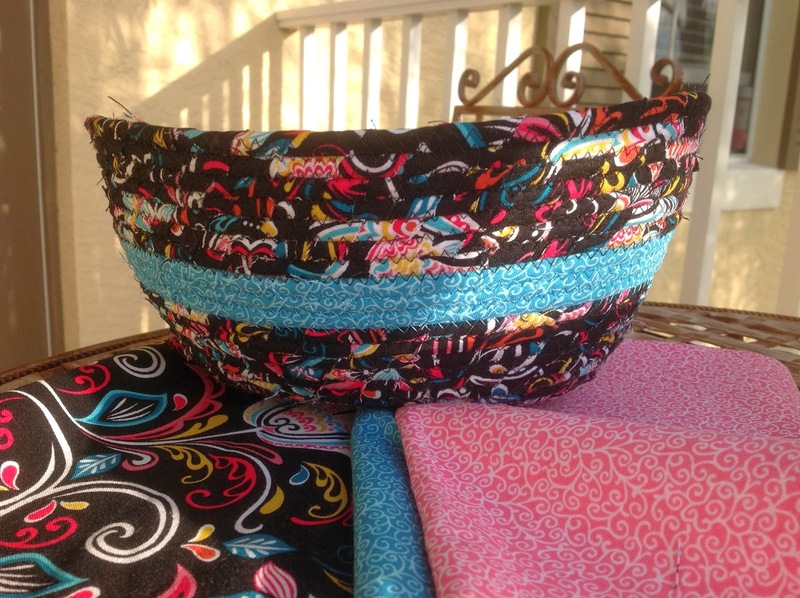 I've made this pattern several times; it's just awesome. 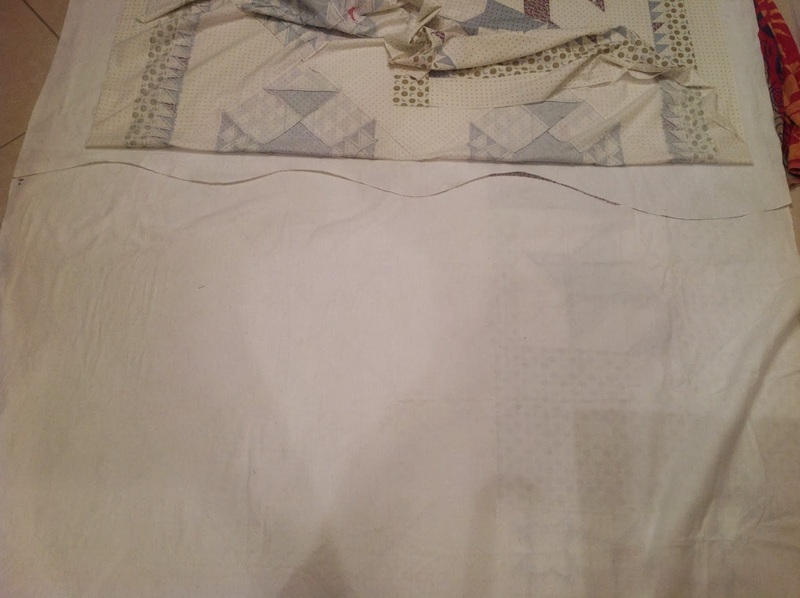 All seams are hidden. 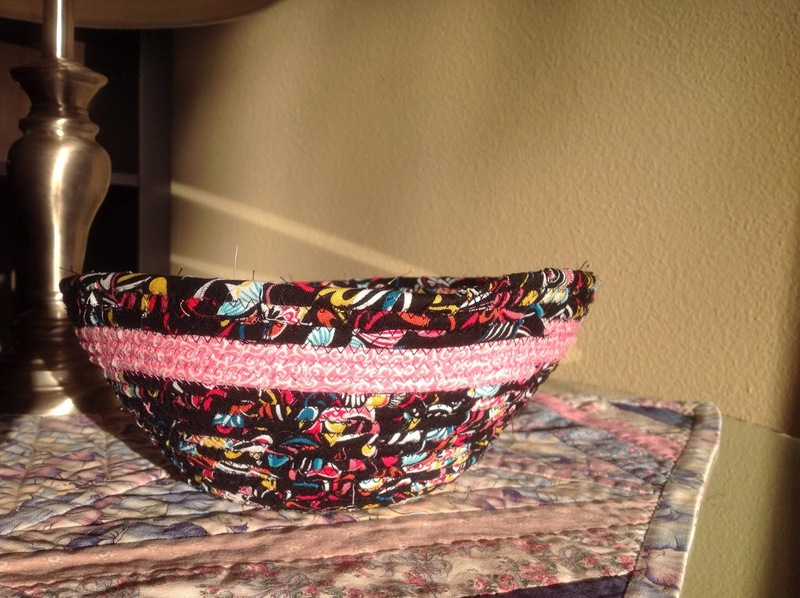 This time I topstitched the contrasting band with Isacord thread. This blog has really been an eye-opener in how it shows me so many things. I am amazed at how much I got done while Dayna was here, and yet had lots of special Mum/daughter time with her. 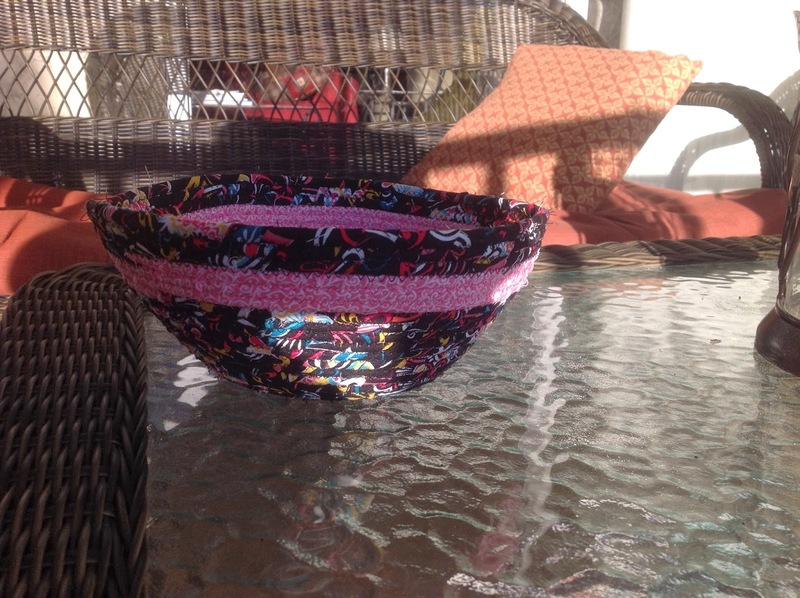 I wouldn't have realized I'd accomplished a fair amount had I not written this post! 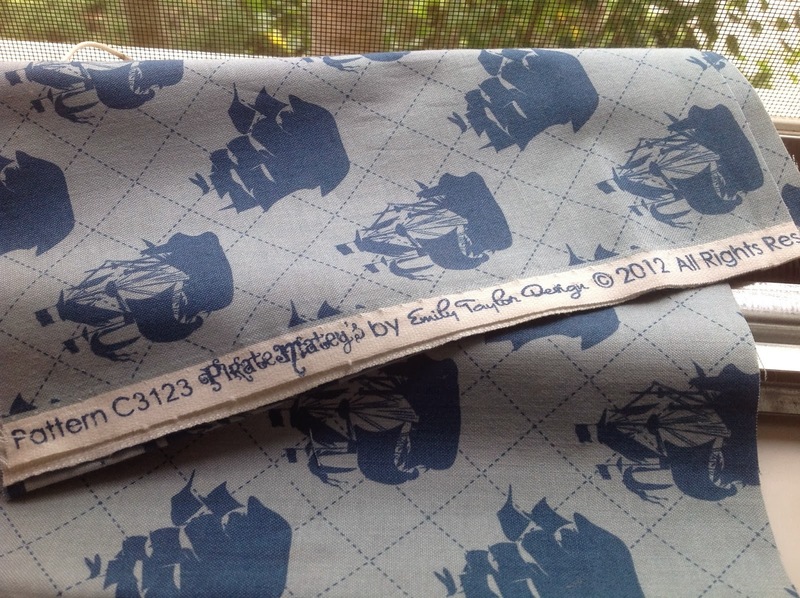 The pirate fabric is Riley Blake. The line is Pirate Matey's. Matey's. WHAT does the Matey own, pray tell? If "nothing" is the answer, and you have more than one Matey, then it's Mateys. An 's' can follow a 'y' people! Or is the phrase, "Pirate Matey is..." ?? Uh, I think not, unless they meant "Pirate Matey is by Emily Taylor Design". Somehow, I doubt it. Example: On Saturdays I teach yoga. Saturday's my favourite day. This means Saturday IS my favourite day. English is confusing, I know. French is much simpler in that it doesn't (does not) have apostrophes to show ownership. They've (they have) even officially stopped adding a plural when you make numbers and letters plural. For example, I have two 3s in my address. Please see this excellent site, and pay attention to Rule #11!! Okay. Breathe, Sandra. 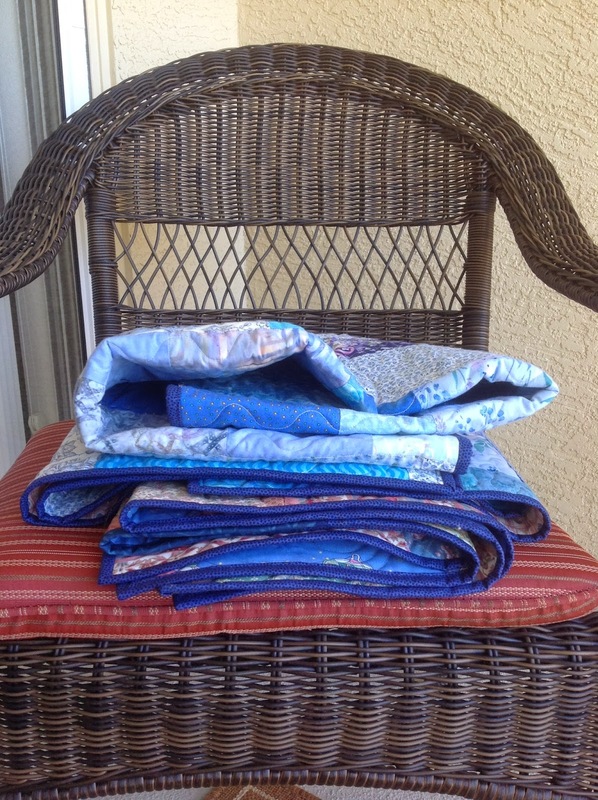 I'm going to go and sew some more! 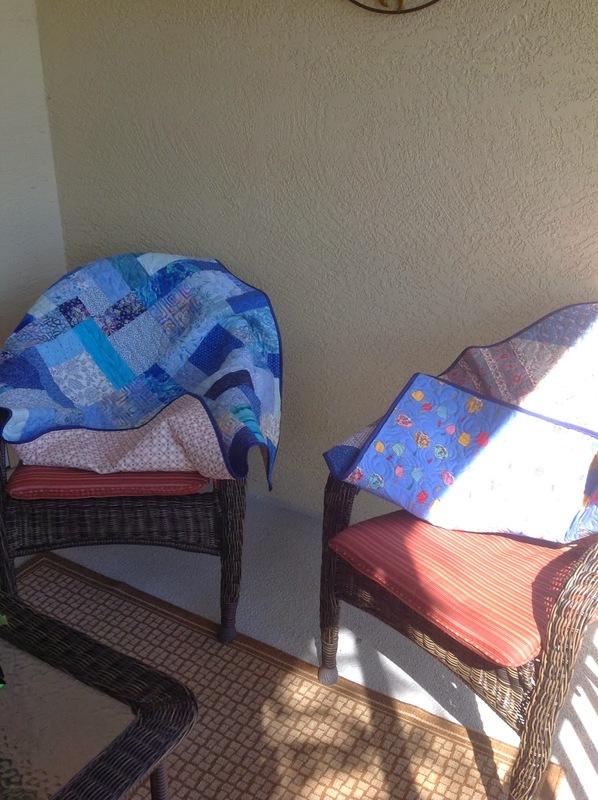 I have: 1) a pristine tile floor just waiting for me to 2) lay out, spray baste and layer my Brrr Park quilt, and 3) pictures to take to show you another Aha! 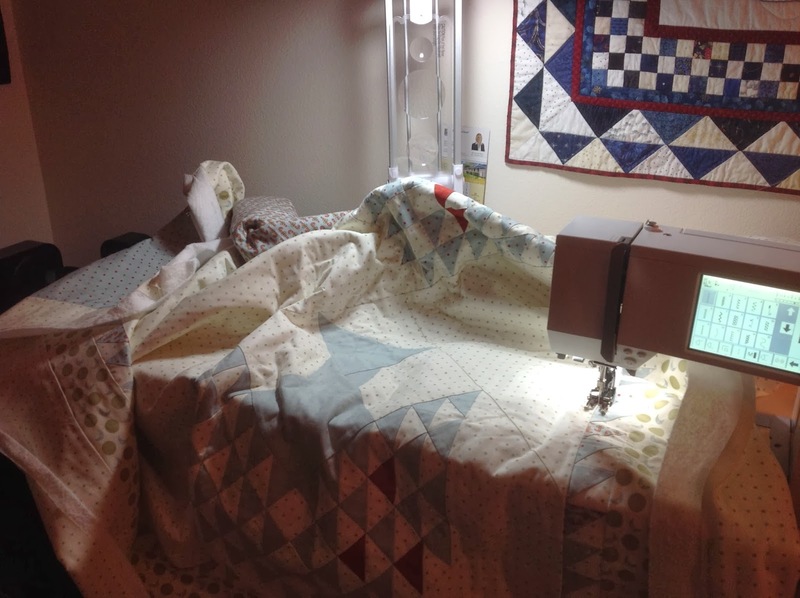 Moment that changed my quilting-on-my-DSM life. Ha, I know there are some bloggers out there who actually do this every Wednesday, but it is not my intent to copy them. I just started typing WIP...and then realized what day it is. Okay, Linda, WIP means Work In Progress. So I've been thinking, what, besides Internet and Scrabble and Scramble with my brother online, (oh, and an excellent book my next-door neighbour loaned me that had me reading 100 pages within the first day!! 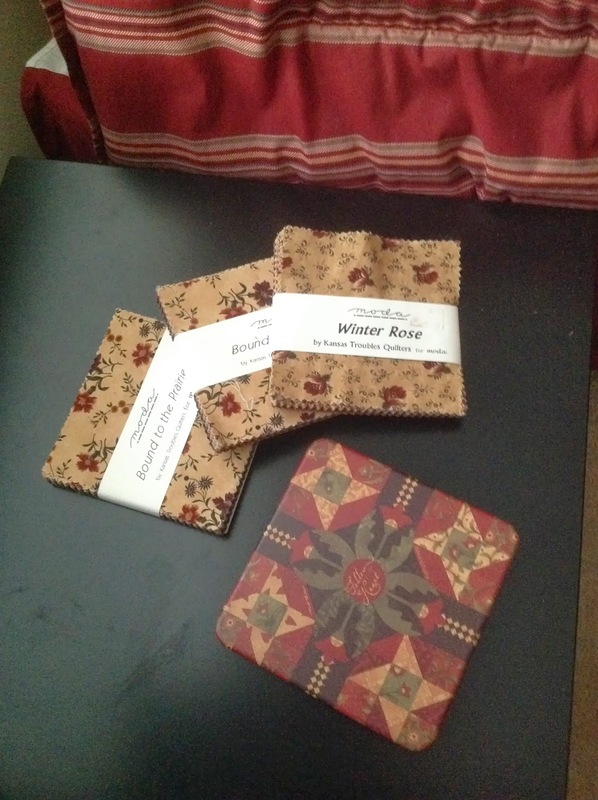 And The Mountains Echoed, by Khaled Hosseini, love all his books) has been hindering my progress on this rather small (36 1/2" square) quilt using the 5" charm squares. . . So here is the painstaking process I've been going through. 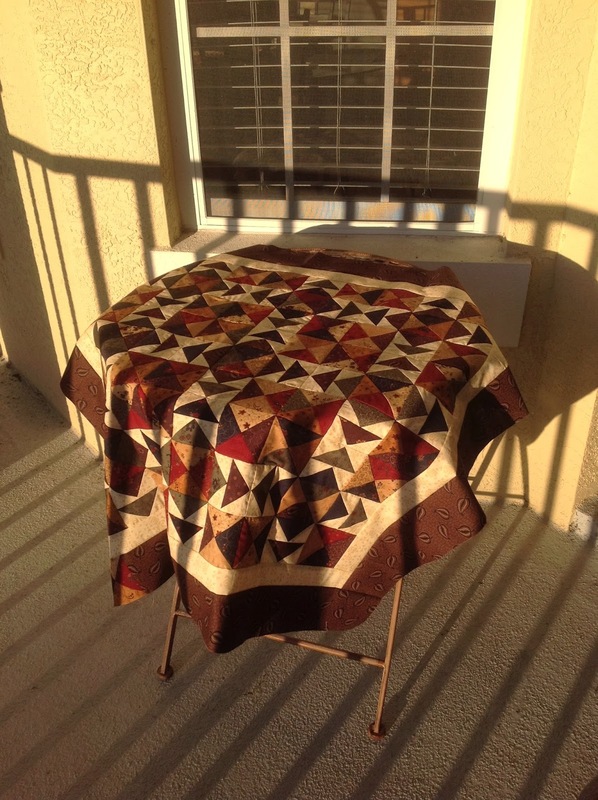 It made me realize how much patience is needed, in quilting, well, in ALL forms of art, be they music, painting, figure-skating. Sidenote: I read that US Dance Pair Meryl Davis and Charlie White spent 3 years, THREE YEARS working on one move that they finally used in the Olympics the other night. 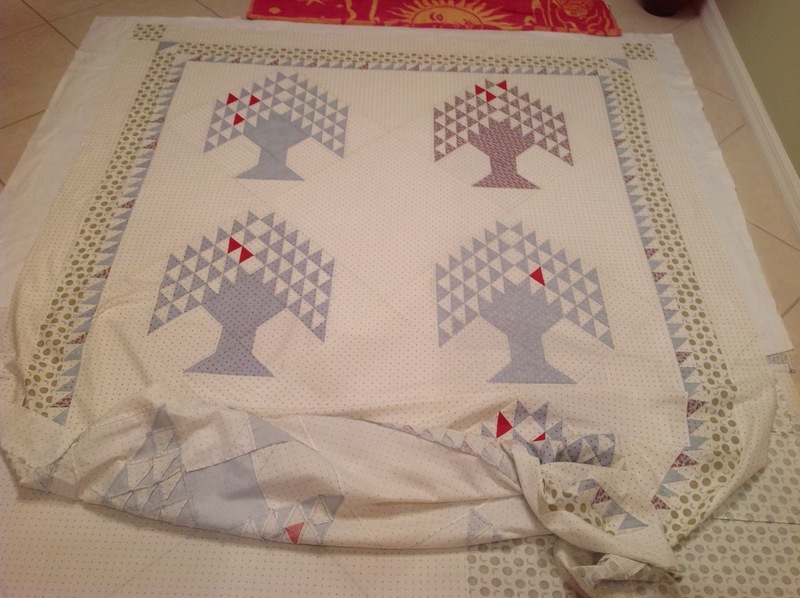 Here is the process for creating the flying geese in this little quilt. And note that I haven't even taken into consideration all the cutting required first! 1. 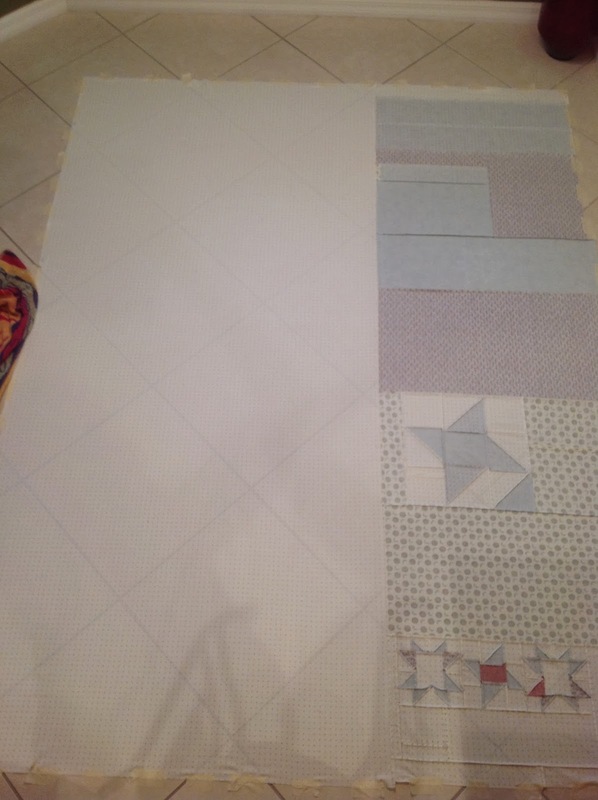 Draw a diagonal line on the back of the 2 3/8" squares. 2. 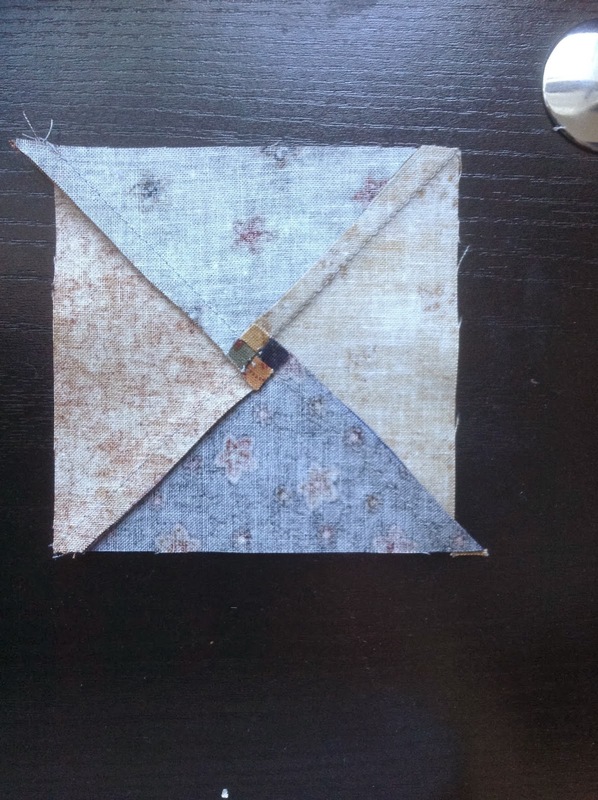 Sew two of these onto the 4 1/4" square, sewing 1/4" seam on either side of the drawn line. 4. Press the seams towards the smaller cream squares. 5. 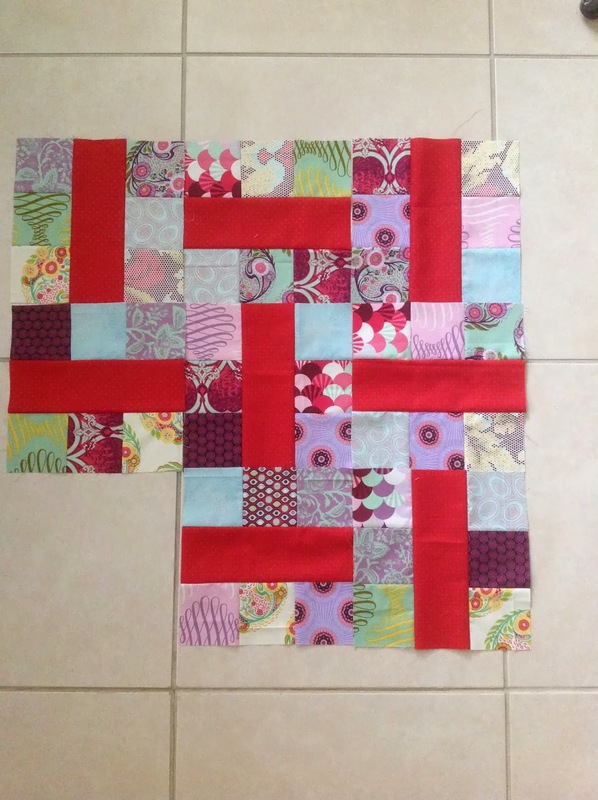 Place another square on the opposing corner. 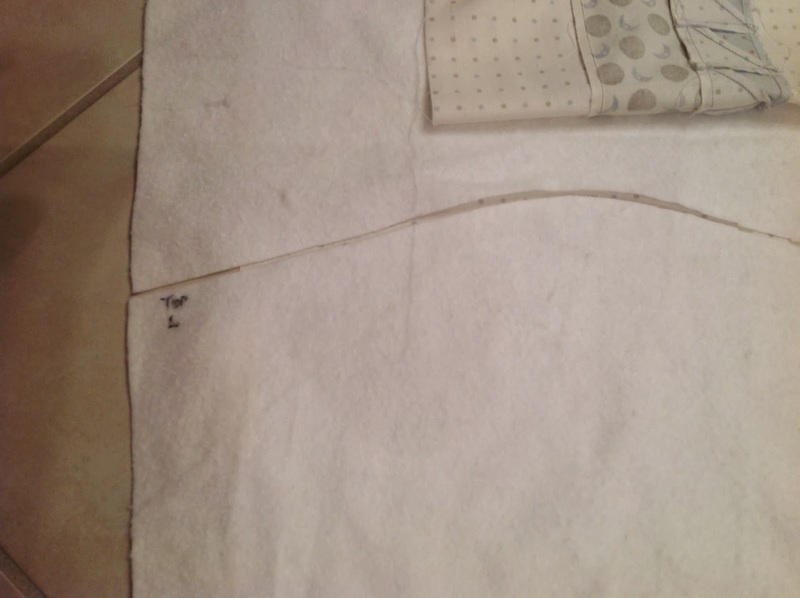 Sew again 1/4' on either side of the drawn line. 6. Cut apart on the drawn line. 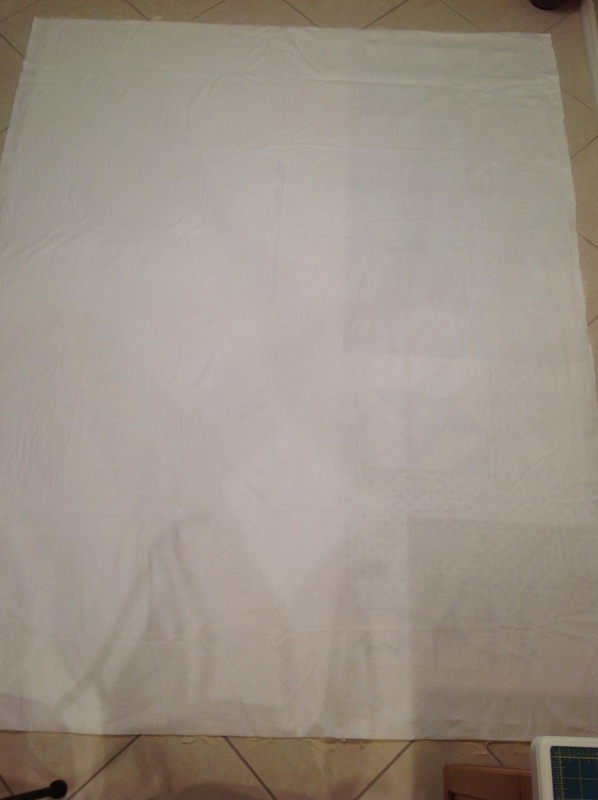 You can see the uncut one below the cut apart one. 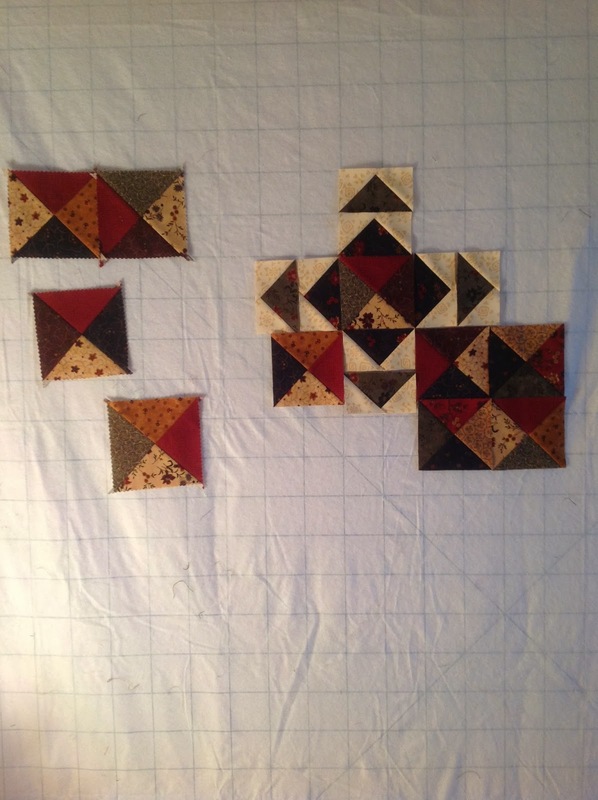 This method yields 4 flying geese units per 4 1/4" square with no waste. 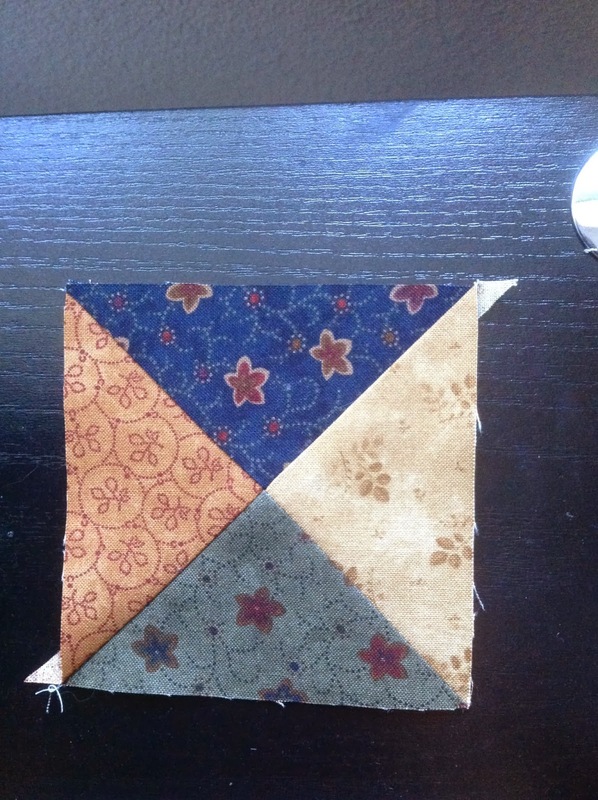 I blogged about it a post or two ago about my Self Round Robin, and this little quilt uses the same method! Love it. 7. Press the resulting cream half square open. Here you see the bottom unit cut apart, and the top units pressed open. 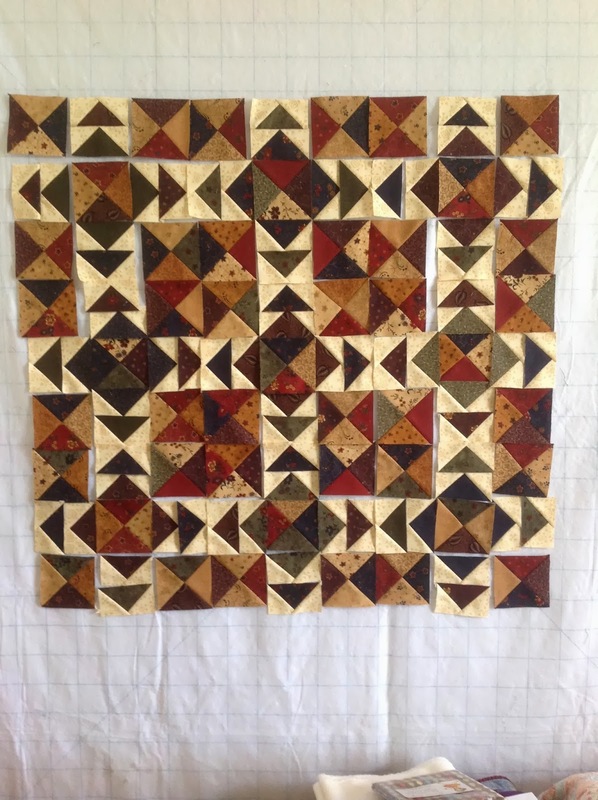 This picture reminds me of my wooden mosaics I loved to play with as a child! 8. And, we're not done yet! 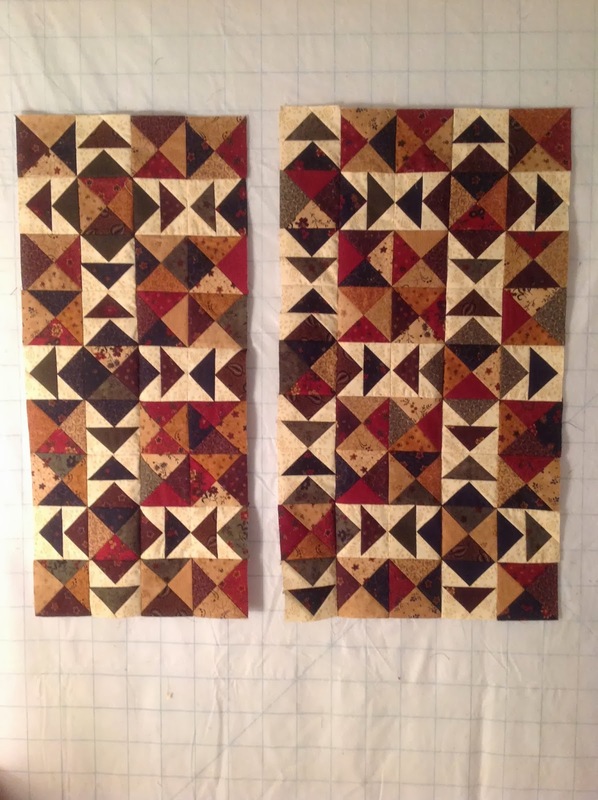 These little babies need to be trimmed to 2X3 1/2", which will also get rid of the dog ears in the corners and top middle. 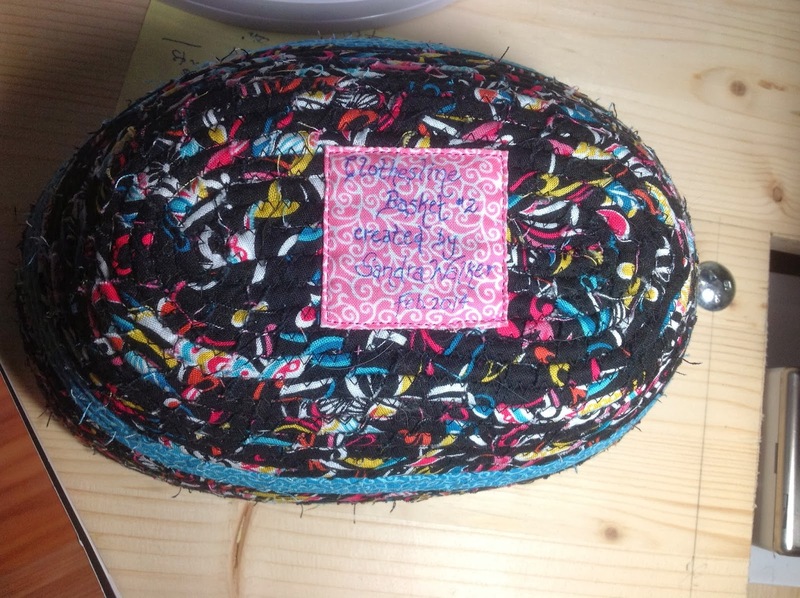 You open the seam 2 or 3 stitches, which allows all the seams to magically twirl open and lie flat! Cool! 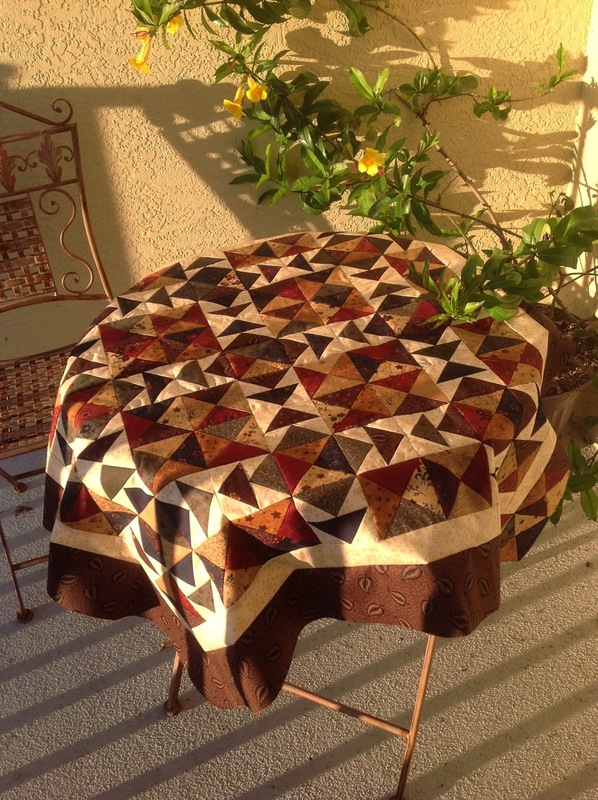 I saw this once years ago on "Simply Quilts" but had forgotten about it. It is so worth buying books, as I always pick up little tips or tricks. 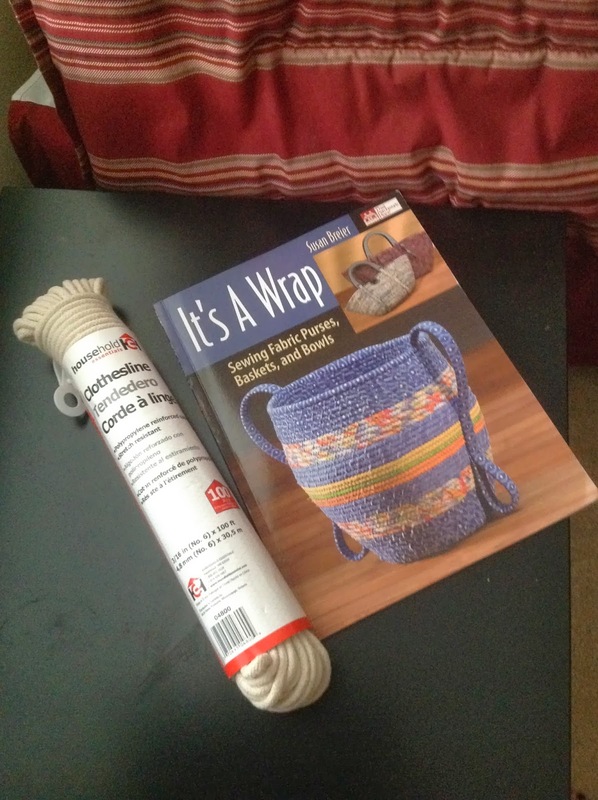 This book has not disappointed yet; I can see myself making more (I want to make them ALL!). It's Another Bite of Schnibbles by Carrie Nelson. 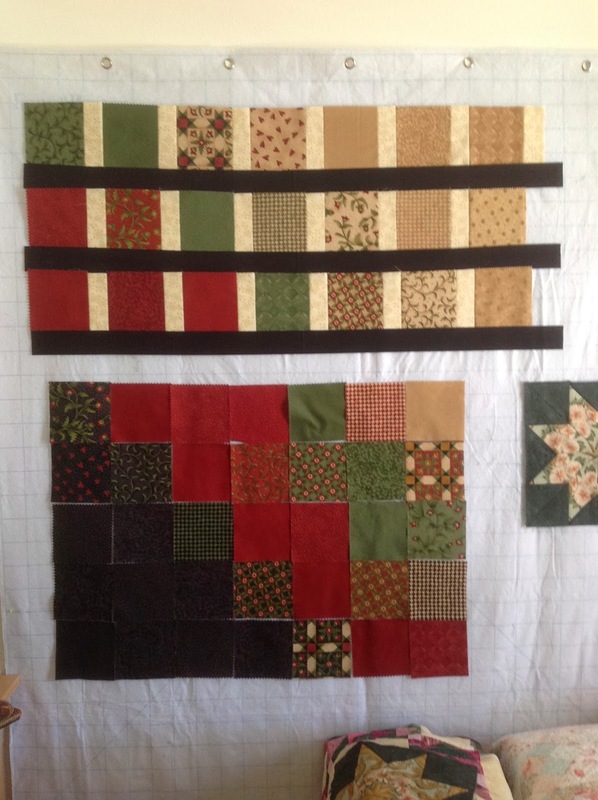 All of these had to be trimmed at each step: first the 1/2 square unit down to 4", and then after you sewed two of them together to get the above 1/4 square triangle unit, you trim again to 3 1/2"! Phew! 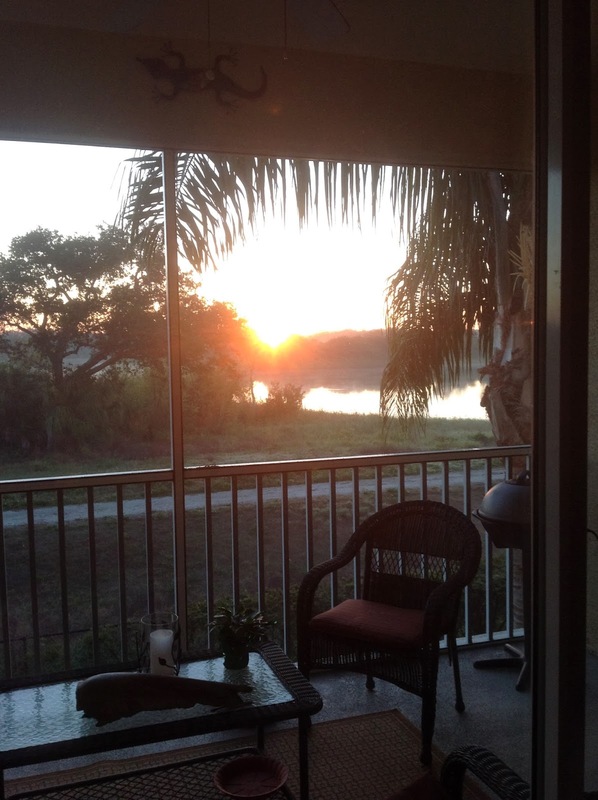 Well, this is actually a post with relatively few words and lots of pictures! I was just saying to my mum the other night that sometimes I have good intentions to write little, but usually get carried away! The thunderstorm we've been experiencing this afternoon is coming back, or else another one is looming. Time to make supper anyhow, before any potential power outage! Nothing like what they are experiencing in Georgia and South Carolina today though with the snow and ice that they are ill-equipped to deal with. At least this time, it sounds like people are prepared and staying home. 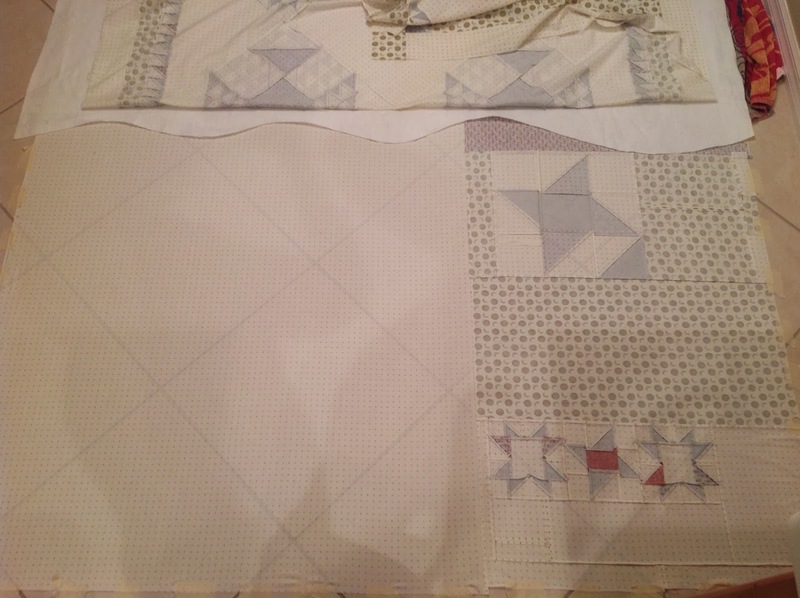 Hope to have a finish within a day or two, well the top for sure by tomorrow!